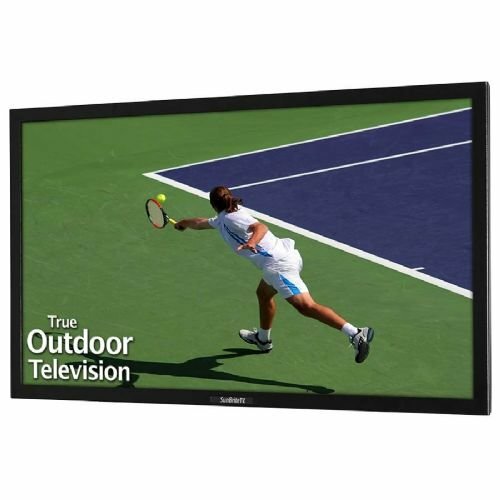 The SunBriteTV Signature Series outdoor LED HDTV 46" is slim, light and bright. The SB-4670HD - true outdoor television designed for permanent outdoor installation - sports a bright full-HD 1080p LED screen for improved outdoor viewing, along with a powder-coated aluminum exterior and all of SunBriteTV's famous weatherproof design and features. It's sturdy and outdoor-safe, yet looks like a trendy, thin indoor LED TV. The SB-4670HD can handle temps from -24 to 122 degrees F. Our specially-designed weather-tight exterior keeps internal components safe from rain, dust, humidity, salt-air, heat, snow and insects. For best viewing experience, place under an awning, roof eave, gazebo, or over-hang away from direct sun. For direct sun use, see our Pro Series outdoor HDTVs. Pair with our NEW HD all-weather wireless transceiver to connect to your cable/satellite box, Blue Ray player or DV-R effortlessly. Take a brief 360-degree video view of this popular SunBriteTV all-weather HDTV. A table-top stand - the SB-TS467 - is sold separately. Non-articulating (SB-WM46NA) and articulating (SB-WM46) weatherproof wall mounts are compatible & available for this model.